What Is Wrongful Death and How Do You Prove It? 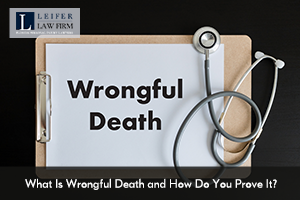 Wrongful death refers to any deliberate action by one person that causes the death of another person as the result of negligence or carelessness. This can involve auto accidents, truck accidents, a criminal act, or a death resulting from the mistakes of a doctor. Florida law allows only the surviving family members of the person who died to file a wrongful death claim. This can include parents, spouses, children, and adopted children. And after that claim is filed, several factors determine whether a plaintiff will emerge victorious. You must prove that the defendant breached his or her duty. For example, a doctor’s duty is to heal patients, so a doctor who caused a patient’s death through an error breached a duty. You must prove that the defendant’s negligence caused your loved one’s death, whether it was a contributing factor, or the entire reason that your loved one died. You must show exactly how the defendant’s negligent actions caused the death of the person you love. For example, if a surgeon left instruments inside a patient, and those instruments caused an infection that killed your loved one, you would be able to show the direct result of the surgeon’s negligence. You must show actual damages you’ve suffered such as loss of future income, and how the death of your loved one has impacted your life (pain and suffering). How Is Compensation Determined In a Wrongful Death Claim? Medical costs – all expenses paid for the care of your family member before his or her death. Inheritance loss – this refers to the fact that the death of your loved one has eliminated any possibility that you could inherit future earnings. Wrongful death claims are often fraught with emotion and conflict, as plaintiffs struggle to live with the loss of a loved one. And these cases are not just about receiving a settlement check, they are also about holding people accountable for negligence and carelessness that resulted in a preventable death. The Leifer Law Firm has been serving the residents of Boca Raton, Fort Lauderdale and West Palm Beach for years, handling sensitive wrongful death claims and helping grieving families obtain the justice they deserve. As an experienced personal injury firm, we have the resources to pursue every wrongful death claim to its conclusion. Please call us today at 561-660-9421 for a free legal consultation.